Stefan Bräse was born in Kiel, Germany, in 1967 and studied chemistry in Göttingen, Bangor (UK) and Marseille (France). In 1995, he obtained his doctorate after working with Armin de Meijere at the University of Göttingen. After post-doctoral appointments at Uppsala University, Sweden (J.-E. Bäckvall) and The Scripps Research Institute, La Jolla, USA (K. C. Nicolaou), he began his independent research career at the RWTH Aachen associated with Dieter Enders in1997 and finished his habilitation in 2001. He became Professor at the University of Bonn that same year. Since 2003, he is Full Professor at the University of Karlsruhe - in October 2009 renamed to the Karlsruhe Institute of Technology. Stefan Bräse has published more than 100 publications and is recipient of the ORCHEM award in 2000. His research interests include methods in drug-discovery (including drug delivery), combinatorial chemistry towards the synthesis of biologically active compounds, total synthesis of natural products and nanotechnology. Forewords: Rolf Huisgen, Valery Fokin, and Barry Sharpless. PART 1: SYNTHESIS AND SAFETY. 1 Lab-Scale Synthesis of Azido Compounds: Safety Measures and Analysis (Thomas Keicher and Stefan Löbbecke). 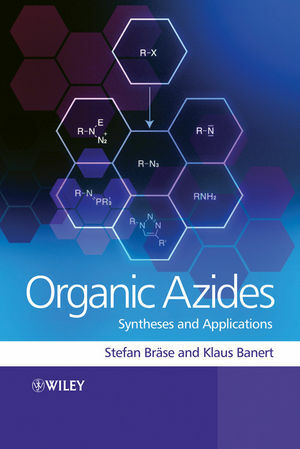 2 Large-Scale Preparation and Usage of Azides (Jürgen Haase). 3 Synthesis of Azides (Teresa M.V.D. Pinho e Melo). 4 Azides by Olefin Hydroazidation Reactions (Jérôme Waser and Erick M. Carreira). 5 The Chemistry of Vinyl, Allenyl, and Ethynyl Azides (Klaus Banert). 6 Small Rings by Azide Chemistry (Thomas L. Gilchrist and Maria José Alves). 7 Schmidt Rearrangement Reactions with Alkyl Azides (Scott Grecian and Jeffrey Aubé). 8 Radical Chemistry with Azides (Ciril Jimeno and Philippe Renaud). 9 Cycloaddition Reactions with Azides: An Overview (Christine Schilling, Nicole Jung and Stefan Bräse). 10 Dipolar Cycloaddition Reactions in Peptide Chemistry (Christian Wenzel Tornøe and Morten Meldal). 11 Photochemistry of Azides: The Azide/Nitrene Interface (Nina Gritsan and Matthew Platz). 12 Organoazides and Transition Metals (Werner R. Thiel). 13 Azide-containing High Energy Materials (Thomas M. Klapötke and Burkhard Krumm). 14 Azide Chemistry in Rotaxane and Catenane Synthesis (Stéphanie Durot, Julien Frey, Jean-Pierre Sauvage and Christian Tock). PART 4: APPLICATION IN BIOORGANIC CHEMISTRY. 15 Aza-Wittig Reaction in Natural Product Syntheses (Francisco Palacios, Concepción Alonso, Domitila Aparicio, Gloria Rubiales and Jesús M. de los Santos). 16 Azides in Carbohydrate Chemistry (Henning S.G. Beckmann and Valentin Wittmann).